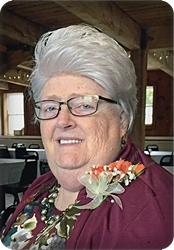 Shirley Bruxvoort, age 78, of Byron Center, went to be with her heavenly father on Sunday, April 29, 2018. Shirley loved to knit and enjoyed arts and crafts. She retired from many years of nursing at Forrest View Hospital. She was preceded in death by her parents; and two brothers. Shirley will be lovingly remembered by her husband of 56 years, James; her children, Tammela (Richard) Konrad, Cheryl (Phillip) Huizinga, Jeffrey Bruxvoort; 18 grandchildren; 14 great grandchildren; brothers and sister, Robert (Martha) Medema, Wayne Medema, Rosalie (Ed) Zobak; and many nieces and nephews. The family will greet visitors on Thursday, May 3, at Heritage Christian Reformed Church. 3089 84th St. SW, from 2 - 4 and 6 - 8 pm and Friday, May 4, from 1 - 2 pm prior to the service at 2 pm. Rev. Bob Bolt will officiate. Memorial contributions may be made to Byron Center Christian School. We wish to express our sympathy to you concerning the death of Shirley, May the Lord comfort you with His promises and with the prayers of your friends and family. Shirley was in my Coffee Break Class at Friendship CRC for the last few years. She always had a smile and loved to talk about her Lord. Rest in Peace my friend. Walk with Jesus with no more aches and pains.